I have been attending The Cart Lodge Art group for the past 10 years and although I am not a painter it has been great to explore different mediums and work alongside talented artists who had been taught and inspired by Anke Loewensprung before she left the area. Krista was approached a year ago by the Christian Community in Forest Row and asked whether we would be interested in exhibiting there. We agreed and met to discuss the exhibition last June shortly before Krista decided to return home to Switzerland to be near her family. In September we realised with all our other commitments that we needed to spend our Fridays that we normally met to paint getting our artwork framed and organising the PR etc. for the exhibition. It is always gratifying and rewarding to see your own work properly framed and ready to hang and we are looking forward to meeting anyone who can make the Open Evening on 28 February. My sketchbook "Book of Stitch & Line" has been submitted to the 2018 Sketchbook Project that opened at Brooklyn Library on 23 June. "Book of Stitch & Line" will be touring with the Sketchbook Project Mobile Library to Toronto, Chicago and Atlanta before being filed at the Brooklyn Art Library, NY. To read more about the Sketchbook Project click here. To view my digital sketchbooks from 2012 and 2018 on the Sketchbook Project website click here. “Volets du Luberon” has been selected for the 7th European Quilt Triennial touring exhibition opening in Heidelberg on 16 September 2018. It was inspired by a sketch of the shutter colours in the Luberon area of Provence using natural earth pigments bought from the Conservatoire des Ocres in Roussillon in the South of France. ViewSeven Exhibition at the Menier Gallery 5-9 December. Artwork is wrapped and ready for hanging on Monday with the other members of ViewSeven. 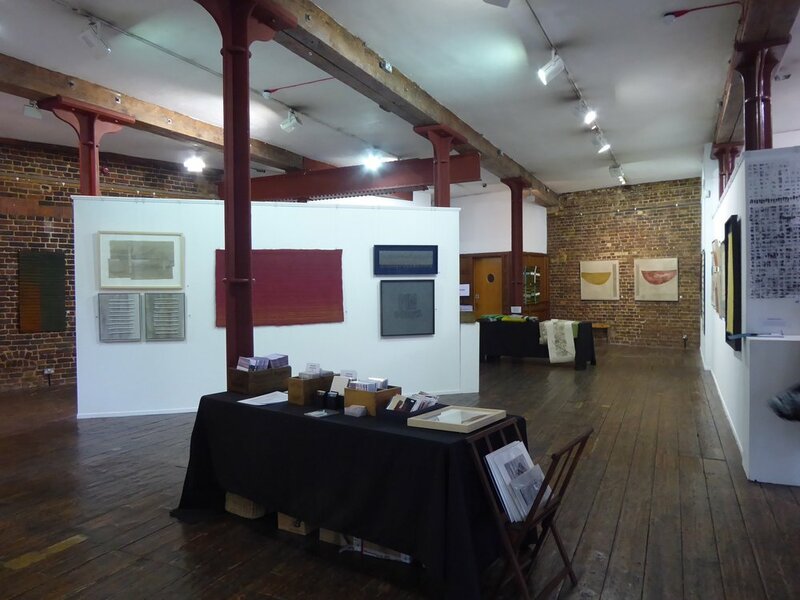 Doors open at the Menier Gallery on Tuesday 5 December at 11am. Received an email yesterday "Keeping Still" above sold on 2 November - the opening night of the SAQA Masterworks: Abstract & Geometric Exhibition at the International Quilt Festival in Houston, Texas. As a feature artist in the book Abstract & Geometric I will be exhibiting "Keeping Still". An invitational exhibition of one work each by 29 artists featured in the new book Art Quilts International: Abstract & Geometric by Martha Sielman. These engaging works of art represent a range of styles across the abstract art spectrum. Participating artists come from Australia, Canada, Europe, Japan, and across the US. This exhibition will premier at the 2017 International Quilt Festival in Houston, Texas. “Harbour Wall” and “Rouge de Madras” are currently part of the catalogued “Grande Finale” European Art Quilt Foundation Exhibition at the Historical Museum de Bevelanden Goes The Netherlands. New year – new studio space. I am so excited to be starting 2017 in my new dedicated studio space after many years of working in my office trying to keep the interior design practice separate from the art ‘studio’ and not spilling pigment or hot wax on the oak floor. Detail of “Blue Hulk” 2016 finished and sold last month was inspired by the old fishing “hulks” on Dungeness beach. It is a great privilege to have been included as a ‘featured artist’ in Martha Sielman’s Art Quilts International book: Abstract & Geometric that was released on 28 December 2016. Once Martha selected my work from images back in 2014 we did an email interview about my work and studio practice and have communicated regularly since to update any information that was relevant until the book went to print late last year. It is a really informative book about the international art quilt genre with interesting interviews with the artists, high quality photographic images of their artwork and a well considered layout so you can see the images clearly which makes it a great reference book. The Summer Exhibition at the RA opened this week and both pieces of my work have sold. “Climping Wood” sold on Buyers Day and “Furnace Wood” in the opening week. The exhibition is great and definitely worth a visit. “Furnace Wood” (846) is in Gallery VIII selected and hung by David Remfry RA and Climping Beach (1014) is next door in Gallery IX selected and hung by David Mach RA, Cathie PilkingtonRA & Bill Woodrow RA. 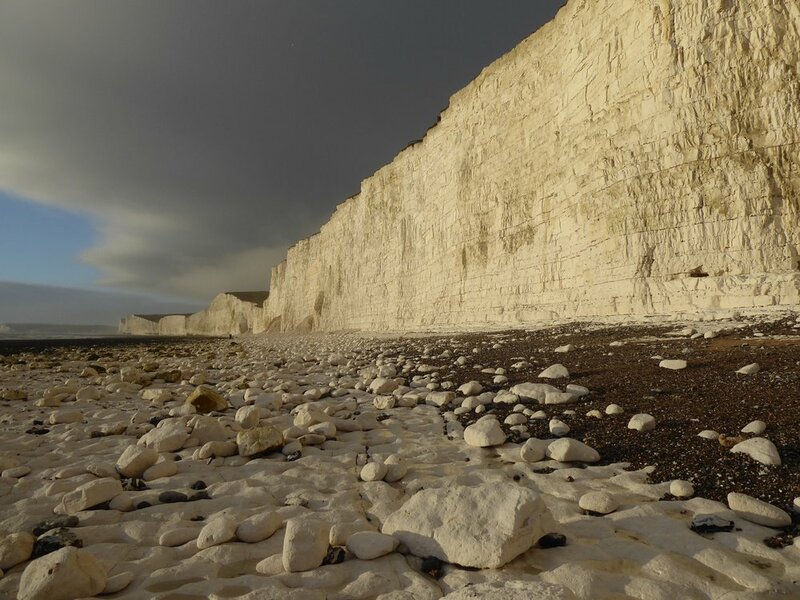 On page 30 of the Summer Exhibition Illustrated catalogue (double page photograph) “Climping Beach” is shown lying on the floor of Gallery IV – the opposite end of the RA from Gallery IX! This is the first year you can view and buy the artwork online Summer Exhibition Explorer. It gives a good overview of the exhibition and details of the artwork in each Gallery. 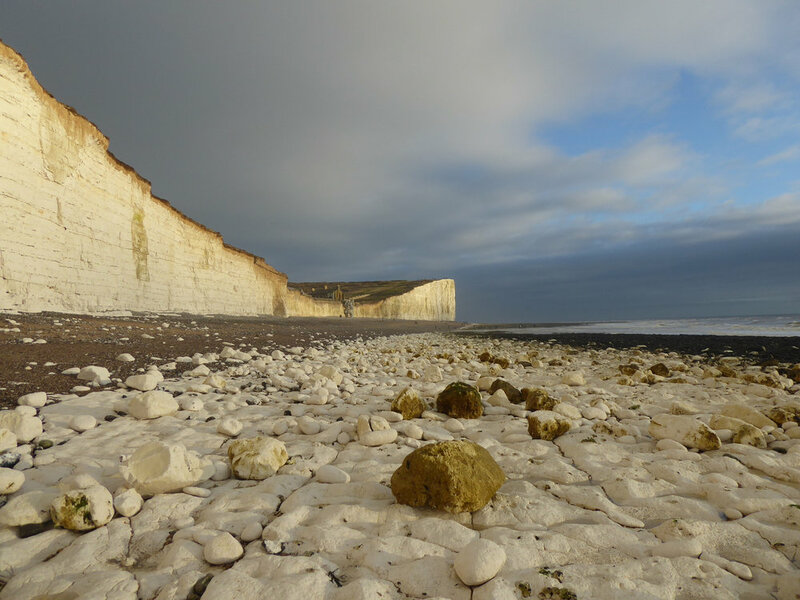 You can view Climping Beach and Furnace Wood. On Saturday 11 June BBC2 broadcast Royal Academy Summer Exhibition. Morgan Quaintance and Kirsty Wark access all areas at the Royal Academy as the institution prepares for its annual artistic extravaganza. This year’s show is curated by the sculptor Richard Wilson and will bemarked by what he calls the ‘wow factor’. ABC bring their glamorous pop genius to the RA and we also hear the stories of the aspiring artists who submitted their paintings in the hope of getting on the walls of this hallowed institution. On Friday 3rd June I join the other Royal Academy of Arts Non-Members for Varnishing Day, historically an opportunity for artists to “varnish” and touch up their work, now a celebration of the Summer Exhibition where refreshments are served and prizes given and an opportunity to see our work hung before the exhibition opens to the public. Prior to the reception we are greeted in the Annenberg courtyard of the Royal Academy by a steel band which leads the procession along Piccadilly to St James’s Church where a service for the artists is held before returning to party in the galleries.